Just west of the Hollywood Freeway on Sunset Blvd, you will find the historic studio that was once home to Warner Bros Pictures. 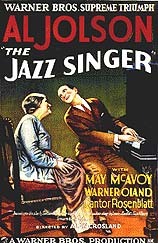 The studio was built in 1919, and it was here that the world's first "talkie" was filmed back in 1927: Al Jolson's "The Jazz Singer," which put an end to the age of silent movies and revolutionized the Hollywood film industry. The classic Warner Bros. "Loony Tunes" and "Merrie Melodies" cartoons were also made here at this Sunset Boulevard studio, including that "wascally wabbit," Bugs Bunny ("What's up, Doc? "), the pesky Road Runner ("Beep! Beep!") and good old Porky Pig ("That's All Folks!"). Notable for its white, Greek Revival facade, and its large broadcasting tower out front, this former Warner Bros. studio in Hollywood, is now home to Tribune Broadcasting, which owns 26 TV stations around the country (as well as the Los Angeles Times). One of those stations is KTLA Television - the local Channel 5 here in Los Angeles. The KTLA studios are located in the back (south portion) of the historic lot. KTLA has quite a proud history all its own. KTLA brought television to the Hollywood. The station signed on the air in 1941 as experimental station W6XYZ. It was the first commercial television station west of the Mississippi, making its inaugural broadcast on January 22, 1947. That first grand premiere show was hosted by Bob Hope, and featured such show business greats as Edgar Bergen and Mickey Rooney. According to The Hollywood Reporter, " the next day, the word went out: TELEVISION IS HERE!" The station recently marked their 50th anniversary. KTLA pioneered the modern techniques of live, on-the-spot news coverage, beginning in 1949 with their live, extended coverage of a child lost down a well. KTLA was the first station to telecast live from a helicopter, and the first to use a mobile news van. In fact, KTLA's current "News at Ten" is still the #1 prime time news broadcast in L.A. (although their rival, Fox/KTTV, is gaining fast). Until just a few years ago, the studio was owned by Hollywood's original singing cowboy, Gene Autry, who also owned the California Angels baseball team. KTLA was part of his Golden West Broadcasting company (which also included local radio station KMPC). Autry used both stations to broadcast the Angels games. But Gene sold his interest in KTLA a few years ago, he sold KMPC in 1994, and he just recently signed over control of the Angels to the Walt Disney Company, who moved the Angel games to their own KCAL (Channel 9). However, KTLA still owns the rights to broadcast the Dodgers games. The old studio was also home to two local radio stations: KMPC (all sports) and K-LITE (easy listening). For years, the studio was the place where they taped the game show "Jeopardy." (I took the test for the show here myself.) But "Jeopardy" has since moved to Sony Pictures Studios, in Culver City. In 2006, however, the WB and UPN (Paramount) merged to form a new TV network, the "CW". It will, in theory at least, merge the best of both networks. That may well bring to KTLA such UPN hits as "Veronica Mars", "Girlfriends" and "America's Top Model". KTLAis justly proud of their live coverage of the Rose Parade and the Hollywood Christmas Parade (until 1998, the latter parade started each year on Sunset Blvd., right out front of the KTLA studio). Alas, there are no public tours of the studios. Your only hope of seeing the inside of this studio is to get tickets to the taping of one of the shows produced here. Recently, they taped "Judge Judy," "Love Connection" and "Malibu, CA" on the lot. When available, you can get tickets to show tapings from "Audiences Unlimited." Office hours are Mon Fri, from 8:30 AM - 5:30 PM. Update: In late 2008, KTLA studios was merged with Sunset-Gower studio (next door), to create the new Capital Studios. The lot will be known as "Capital Studios at Bronson", while KTLA will be known as "Capital Studios at Sunset Gower". Together, the new studio will cover 28 acres, with 23 sound stages and 700,000 square feet of office production space. Getting there: KTLA Studios is located on Sunset Boulevard, between Van Ness Avenue and Bronson Avenue (just west of KTTV/Fox Studios). / From the Hollywood (101) Freeway, take the Sunset Boulevard exit. Go west on Sunset two blocks, and the KTLA Studio will be on your left (south) side. (Look for the large broadcasting antenna out front with the letters "KTLA.") / From Hollywood & Vine, take Vine Street south (two blocks) to Sunset Boulevard. Turn left (east) on Sunset and go east about half a mile. The studio will be on your right (south) side.